The tree top adventure park, located within walking distance of Ossiach, features 80 exercises at all difficulty levels. The heavy tree canopy guarantees climbing fun in any weather condition and the safety equipment provides the absolute maximum level of protection. 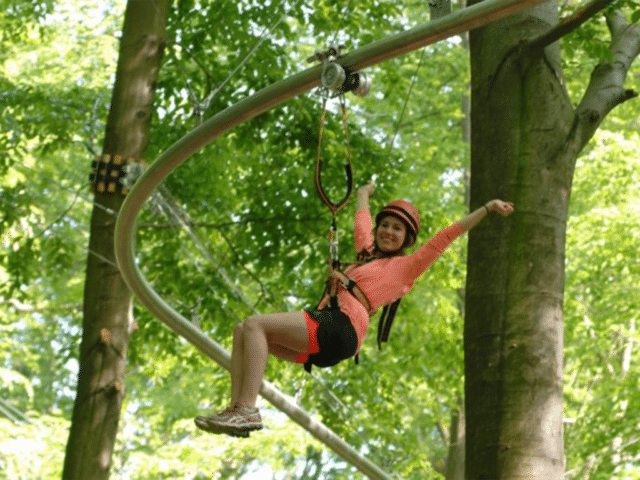 Their state of the art “Fly-Line” system was the first zipline rollercoaster in Austria and it makes participants feel like they are properly flying between the trees and ravines. The park is perfect for company outings, birthday parties and incentives, and they offer numerous activities for organised congress groups, such as a guided climbing tour with a certified ropes course trainer, a “bio” breakfast or lunch prepared from local products, or tasting traditional Carinthian “jause” on their panorama terrace. The park also features seminar rooms for incentives or group meetings, located just a 10-minute walk from the park.